The ESMT MBA is an excellent investment into your future. On average, graduates earn more than double the tuition during the first year of employment after the program. Most students fund their studies with a mix of personal funds, loans and scholarships. To help make studying for an MBA a reality, ESMT Berlin offers access to the following loan programs, as advertised by the providers below. Prodigy Finance is revolutionizing student finance. Our innovative model offers alumni-funded loans to international students at the world’s top business schools, including ESMT. Brain Capital offers ESMT degree seeking students who are citizens of the EU, Canada or the USA the ability to cover tuition fees through an innovative funding scheme. It is a proven way to secure the funds you need to support your education goals at ESMT. Repayment terms are very favorable. 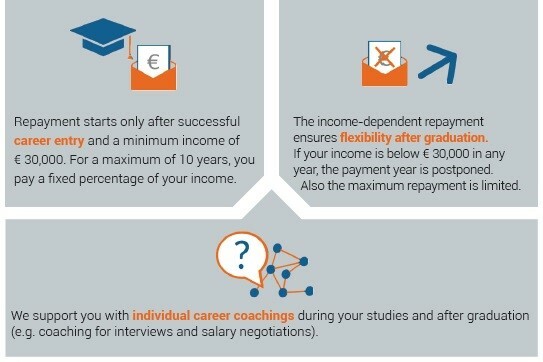 After graduation, payment only starts once a certain salary threshold is reached again.